Here we are at the end of March….AND….I just had an AHA moment. A BIG one! So BIG…that it has caused a “Transitional Shift” on my Weight Loss Journey. I just realized after two years…. (not kidding)….that I NEVER need a “Take-Out” box, when I go out to eat. Almost everyone around me, usually takes a portion of their food home with them. NEVER me! I also started playing “pickleball.” Ever heard of it? It’s a combination of tennis, badminton and ping-pong. You usually play with a partner and the court is smaller than the size of a tennis court. You also play with a plastic “wiffle” type of ball and the racquets are square! I LOVE it! Another physical activity I want to do! Well, I started playing….and after just a few games, my knees are killing me! I’m in MUCHO pain! I NEED to lose more weight to keep the burden off my knees and ankles. How much?? I have no idea. I just know that I have to do this for my health. So……if you are an EMOTIONAL EATER….and/or you “Over Eat,” you should JOIN the Weight Loss Nation Community. I am going to be concentrating on EMOTIONAL Eating and Portion Sizes. If you’re a woman….you are an EMOTIONAL EATER….AND you OVEREAT because your PORTION SIZES are too big….PLEASE JOIN the Weight Loss Nation Village! We will conquer this together! I drink my Laso Tea everyday and I POOP EVERYDAY. If you’d like to try the tea…..go to my website….. When you do, I want you to know that I may receive a small commission. 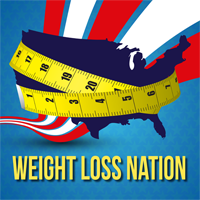 Check out the Weight Loss Nation Community and get the Support You Need for Living a Healthy Lifestyle!